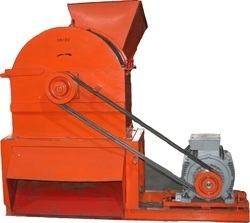 Prominent & Leading Manufacturer from Rajkot, we offer biomass shredder and biomass crusher machine. Biomass Shredder is a combination of two machines i.e. Crusher and Shredder, where the crusher crushes the raw material collected from various sources such as Agricultural fields, Forest place and Garbage dumps in the outskirts of a city. And afterwards, the shredder grates the chopped raw material into tiny pieces for next process of production of Briquettes. For Chipping and Shredding of biomass Agro & Forestry waste such as Groundnut Shell, Wood Chips, Wood waste, Tree Bark, sugarcane Trash, Palm Waste, Coconut Shell, Cotton stalks etc with maximum moisture content up to 50% and having the maximum diameter up to 50 mm. Powder performance and durability: for long-term profitability, our chippers/Shredders are the perfect solutions with stationary motor or Engine drove models and machines that connect to a Tractor PTO mount to your tractors 3 point hitch. 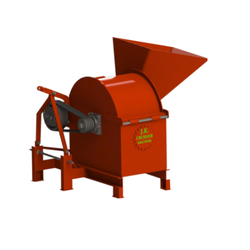 With a big loading hopper, you can shred leaves, small branches, and coconut shells etc. In record time by shredding knives. To chip branches up to 3” dia, feed them into the chipping chute. A dynamically balanced rotor faceplate. V belt drive to the rotor and alloy steel hardened chipping blades for branches up to 3” dia and free-swinging reversible shredding knives are fitted or taking on a variety of jobs. The easy-feed hopper allows for smooth entry of leaves and other organic waste. Our machine-made of durable 5mm and 2 mm steel plates with heavy duty welded construction and strong motor mounts. Our Biomass Crusher Machine made of durable 5mm and 2 mm steel plates with heavy duty welded construction and strong motor mounts. Looking for “Biomass Crusher Shredder”?